Crown gall is a bacterial disease caused by Agrobacterium tumefaciens (syn. Rhizobium radiobacter), which produces tumour-like swellings on the bark of trees and plants. It can infect a wide range of dicotyledonous (broad-leaved) plants, particularly members of the Rosaceae (rose) family such as roses, raspberries, almonds, cherries, peaches, pears and apples. 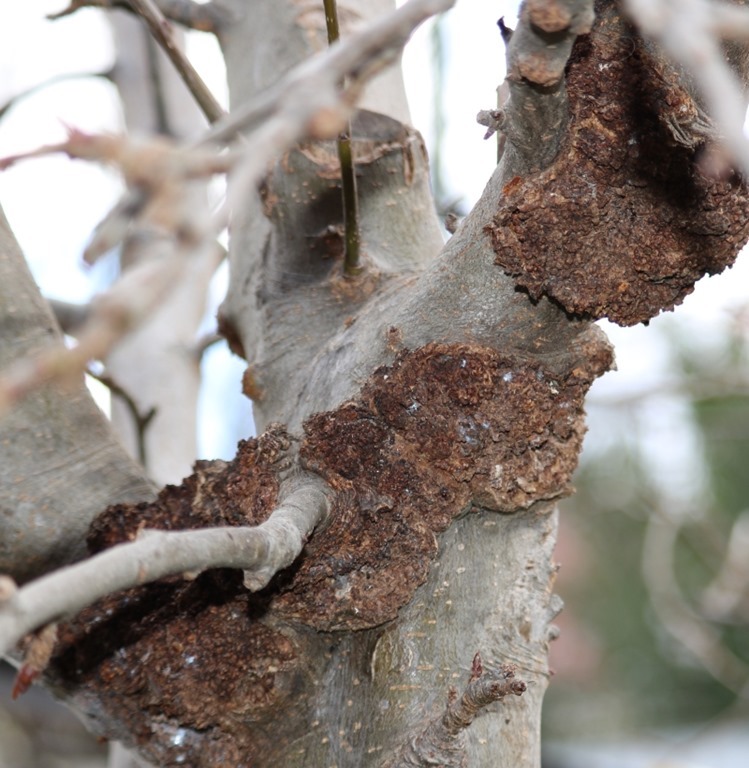 These disease-causing bacteria live in the soil and only enter fresh tree wounds (less than 24 hours old), which are often caused by insect and frost damage, mechanical damage from mowers and lime trimmers, pruning, or transplanting damage. Crown gall bacteria are able to detect the various phenolic compounds which wounded dicotyledonous plants release as chemical signals in their defence and repair process, enabling them to home in on the wounds and infect the damaged plant cells. They don’t just infect the plant though, the Crown gall bacteria insert some of their own bacterial DNA into the plant cells, altering their functioning and causing them to produce unusually large amounts of plant hormone, which in turn stimulate the plant cells to multiply and enlarge, leading to tumour or gall formation. The galls can form on both the roots and the trunk of a tree, and they can also form at graft unions or at the base of the trunk at the root crown, just below soil level. The bacteria can spread into branches through pruning cuts and other damage. Identification of crown gall is made more difficult by the fact that the appearance if the galls changes over time. Galls start off light-coloured, soft, and spongy, then become rough and corky with an irregular surface and a hard woody interior, and as they mature, they turn dark brown and woody. Some galls will disintegrate over time and others may remain for the life of the plant. Galls grow in size over time, affecting the growth, health and vigour of the plant. Galls impede the flow of water and nutrient movement in the plant, as they effectively cut off the bark in the site of infection. Reducing the flow of water and nutrients in a plant causes slow growth, stunting of the size of the plant, deficiency symptoms such as chlorosis and a decline in the overall health of the plant. If galls grows large enough to extend right around a branch or trunk, they can girdle (ring-bark) the tree, causing decline and possible death of the tree, depending on the location of the damage. Crown gall may kill a very young apple tree by girdling the stem, while a mature apple tree may be able to tolerate it and remain productive. The crown gall bacterium Agrobacterium tumefaciens can persist in the soil in decomposing plant debris for long periods of time, it may live saprophytically (living on dead organic matter) in soil for up to two years. It can only proceed in its life cycle if it finds fresh wound to infect and form galls. Without wounds on trees and plants, no galls can form. These bacteria mainly live in the outer portions of primary galls, which can break off and fall to the soil, spreading the bacteria. The centre part of the gall is dead and contains no bacteria. Secondary galls may also form without any bacteria present on other parts of the plant or around other wounds. Crown gall bacteria can overwinter both in the galls and in the soil, and reinfect any plant wounds they come in contact with, completing the disease cycle. There is no known cure for crown gall disease, and the best control is prevention. If there are not too many galls, the branches and parts of the trunk where the tumours occur can be pruned off and destroyed – do not compost infected plant material! When pruning, disinfect pruning tools between cuts. Use either a solution of 70% alcohol and 30% water, or a 10% bleach solution (1 part bleach with 9 parts water). If the tree is too heavily infected, the recommendation is usually to dig up, removing as much of the roots as possible, and to destroy all infected plant material. Avoid wounding trees in any way, especially during transplanting. Don’t replant susceptible fruit trees trees in an area where crown gall infections have occurred. Cover young trees during extreme frosts with hessian or geotextile fabric as a frost cover to prevent frost damage. 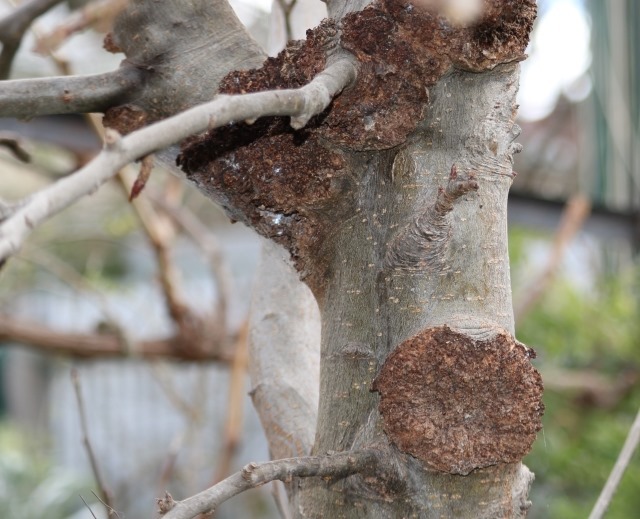 Biological control agents exist for preventing crown gall in apples and many other fruit trees, as well as berries and ornamentals (but not grapes). A non-pathogenic (non-disease causing) strain of the same bacterium (Agrobacterium radiobacter strain 84) has been used to protect plants against infection by crown gall bacteria in the soil. Plants are dipped into a suspension of the protective Agrobacterium radiobacter strain 84 at planting time to keep plants free from disease. This biological control cannot cure plants which ae already infected . Some suggest removing existing galls with a sharp pruning knife, destroying the infected plant tissue and treat the wound with a chemical control. The references are vague in respect to the chemicals mentioned, so to provide further detail, I had to do a lot of time consuming and fairly unproductive literature searches. The creosote based chemical compounds are a mix of 2,4-xylenol (0.463%) and meta-cresol (0.466%), sold in a commercial product known as Gallex, it’s pretty toxic and not something you would want contaminating the soil. The copper-based solutions refer to copper fungicides such as copper oxychloride, which seems to show the best results of the copper compounds from my searches of the literature. The strong oxidants such as sodium hypochlorite refers to common household bleach, read the ingredients on the label and it should be listed there. What they’re saying is that cutting away the gall and spraying with these chemicals may or may not be effective. What is clear from research is that applying copper and bleach-based bactericides reduce many A. tumefaciens populations on the surface of plant cells. Want to try a safe chemical control? You can cut away the gall, mix up some copper oxychloride fungicide or a 10% bleach solution and spray the cleaned up wound area, it may not eliminate the crown gall disease but may stop it spreading. Mikiciński, Artur & Sobiczewski, Piotr & Berczyński, Stanisław. (2012). Efficacy of fungicides and essential oils against bacterial diseases of fruit trees. Journal of Plant Protection Research. 52. 10.2478/v10045-012-0075-7. This entry was posted in Gardening Information, Pests, Diseases & Problems, What's New! and tagged Agrobacterium tumefaciens, apple tree disease, bark disease, biological control, chemical control, crown gall, plant disease, Rhizobium radiobacter. Bookmark the permalink.